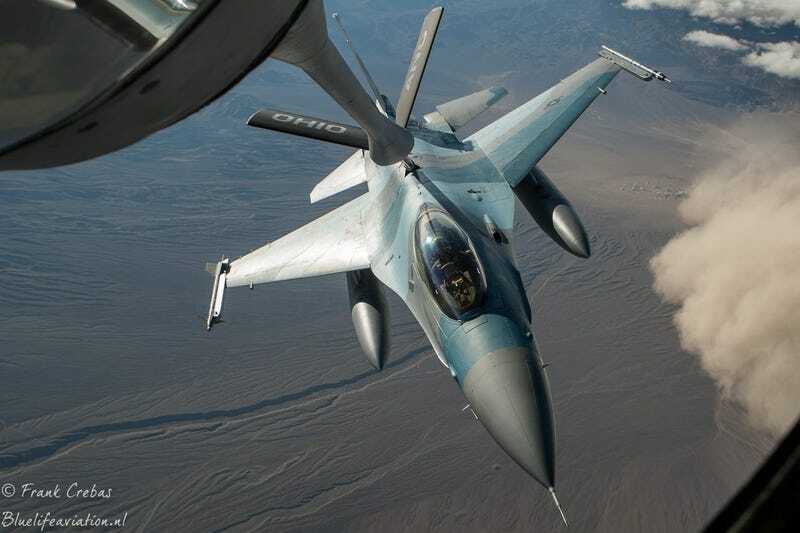 Our good friend Frank Crebas of Bluelife Aviation Photography captured these amazing images of a 64th Aggressor Squadron F-16C refueling high over the Nellis Range Complex while an ominous sandstorm rages below. The shots were taken at the height of a Red Flag air combat exercise. We know that the U.S. military loves to train in as accurate battlefield conditions as possible, but this is a whole other level. Sand storms in the middle east have hampered combat operations before. Most famously, a historically large sand storm occurred during Operation Iraq Freedom on March 25, 2005. The event shutdown almost all combat operations and turned the battlefield into a eerie post-apocalyptic like landscape. Oddly enough, one of most celebrated F-16 missions of all time, flown by F-16 pilot extraordinaire Dan Hampton, took place during this crazy atmospheric event. If anything else, the mission showed that even under the worst flying conditions imaginable, the F-16 remains an incredibly deadly weapon system when flown by the right hands. For more reading, I highly recommend Dan Hampton’s memoir, Viper Pilot. The recounting of this medal-earning mission alone is worth the price of admission.